Time for a Progress Check - You CAN Go the Distance! During a marathon, most runners do some self-evaluation and progress checking at the half-marathon, 13.1 miles, mark. We ask ourselves: How am I feeling? Am I ahead of or behind my planned pace? Any unusual aches or pains? Based on how I feel and knowing the weather conditions, do I need to make any mid-course adjustments? Just as you will inevitably go through this thought process during the race, it is essential you go through it at the mid-point of your training. How are you doing? Are you getting in your speed and Tempo Runs? Are you getting faster, stronger? How about the Long Runs? Any nagging pains, injuries or other physical or mental concerns? These are the questions you need to be asking yourself now. And not just asking… realistically answering them is crucial to the rest of your training! Based on your answers to the questions above, you may be doing great and are right on schedule or you may need to make some adjustments to your physical and emotional expectations. Please, if this is going to be your first marathon, do not under estimate the amount of emotional endurance this race requires and the impact it will have on you if train hard and do not meet your goal. If you need to make some adjustments to your race goals, that is OK! It is better to make them now, by choice, instead of 1 or 2 weeks before the race, or, worse yet, during the race, out of necessity! It’s time for a Benchmark Run! A benchmark run can be a few different things. It can be a shorter-distance race like a half marathon or a 10K. Or it can be a run you do on your own or with a friend at a specific pace. Back in the chapter on goal setting, I recommended using Greg McMillan’s Running Calculator, also known as an “equivalent effort” calculator, to help you determine your ideal marathon goal. The concept is very simple. Plug in your best race time for any given distance and it will tell you what time/pace you should be able to perform for other distances. For example, if your best 10K is 50 minutes, you should, with proper training, be able to run a marathon in 3:54 (3 hours, 54 minutes). To determine the pace for a benchmark run, just use the calculator backwards. If your goal is to complete a marathon in 4 hours, you should be able to race a 10K in 51:09 (an 8:14 pace) or a 5K in 24:38 (a 7:56 pace). Plug your marathon goal into the calculator to get your specific 10K and 5K paces. Now, do not misunderstand me. These equivalent effort paces assume that you are in peak condition to run your 4 hour marathon. You are not yet! So do not go race a 10K this weekend and expect to finish in 51:09! In fact, trying to do so can cause an injury or make you too sore to continue with next week’s training! Somewhere around 10 weeks into your training, I want you to do a 5K benchmark run using the pace suggested by the calculator for a 10K. In other words, try to run a 5K as close as possible to your target 10K pace. Using the example above, you should try to run your 5K at a 8:14 pace. I recommend you swap out one of your Yasso 800s or Tempo Run workout days and make that a 5K benchmark race day. If you can run a 5K at your target 10K pace at 10 weeks into your marathon training, you are right on target! If you come close but fall a little short of the 10K target pace, do not worry about it. Just keep training. However, if you really pushed with everything you had for your benchmark 5K and were significantly off of the 10K target pace, that’s OK. You are NOT a failure! You just need to adjust your goal to something more realistic. Go ahead and plug the time for the 5K you just ran into the calculator, do a mental reset of your expectations, and use the new marathon estimate as your new marathon goal! Remember, the most important thing is to set yourself up for success and this is a great way to do that! Under-trained is better than Over-trained! I am willing to bet many of you reading this are just like me. If I think I am falling a bit behind in my training, I will push really hard to catch up! Do you, too? I thought so. Do not do it! I want you to resist the urge to train harder if you are falling a bit behind schedule. I have done it before and I have a friend who seems to do it every single time. We push harder in the last few weeks and, sure enough, we get injured! If you are using a well-known, time tested training program, stay on it. Trust the experience that went into developing the plan! I would much rather go into a marathon a little bit under-trained than to push too hard, over-train, and get injured or not perform well because you were just worn out come race day. Great advice about under training than over training… Knowing me I would of probably pushed so hard and got injured but thank God for this advice and helping prevent any injuries. 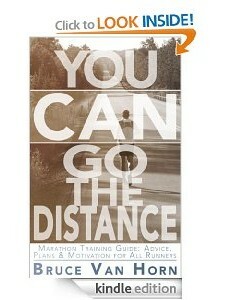 I’m 6 weeks away from my first marathon and this book is helping so much!